Ella Watson, the subject of photographer Gordon Parks's famous and pointed portrait "American Gothic, Washington, D.C.," rented rooms on this block at 1433 11th Street. Watson worked as a cleaning woman in the headquarters of the Farm Security Administration, a New Deal agency that employed writers and photographers to document conditions around the country during the Great Depression. In 1942 Parks, the FSA's first African American photographer, spent a month capturing Watson at work, church, and home. his work from that of those white FSA colleagues who captured only the despair of African American poverty. Sixty years earlier, when this area of modest buildings was known as Hell's Bottom, a saloon occupied the building where Ella Watson later lived. It was one of many forced to close in 1891 after the minister of nearby Lincoln Memorial Church led a campaign to revoke liquor licenses and clean up the neighborhood. 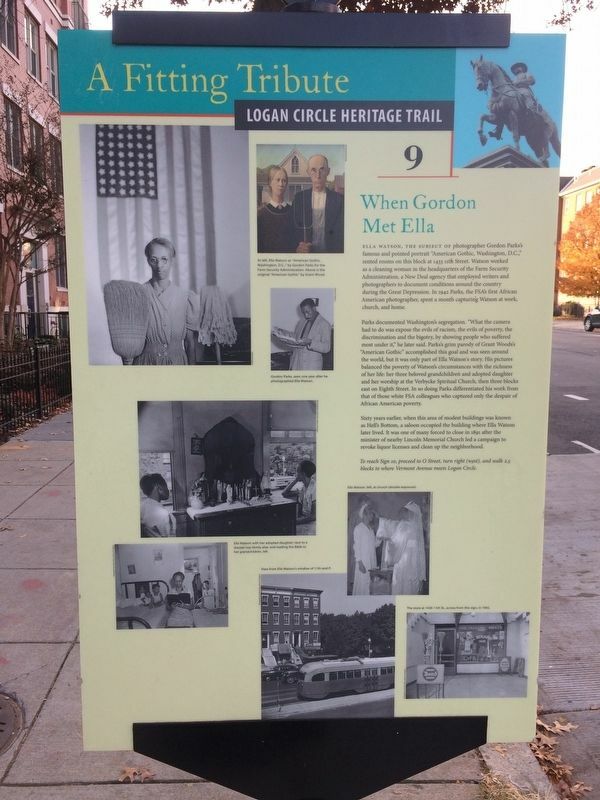 To reach Sign 10, proceed to O Street, turn right (west), and walk 2.5 blocks to where Vermont Avenue meets Logan Circle. this Heritage Trail comes from General Logan's argument that Memorial Day would serve as "a fitting tribute to the memory of [the nation's] slain defenders." Location. 38° 54.565′ N, 77° 1.618′ W. Marker is in Shaw, District of Columbia, in Washington. Marker is at the intersection of 11th Street Northwest and P Street Northwest, on the right when traveling north on 11th Street Northwest. Touch for map. Marker is at or near this postal address: 1437 11th Street Northwest, Washington DC 20001, United States of America. Touch for directions. Other nearby markers. At least 8 other markers are within walking distance of this marker. John Logan Memorial (about 600 feet away, measured in a direct line); If These Mansions Could Talk (about 700 feet away); Major General John A. Logan (about 800 feet away); Logan Circle, Just Ahead (about 800 feet away); A Neighborhood Reborn (was approx. 0.2 miles away but has been reported missing. ); Alley Life (approx. 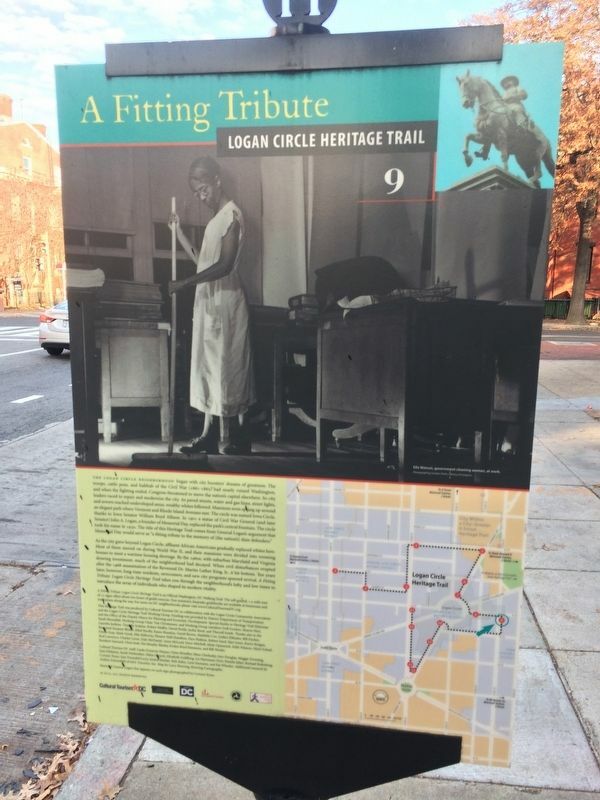 0.2 miles away); a different marker also named Logan Circle (approx. 0.2 miles away); Old Korean Legation Museum (approx. 0.2 miles away). More. Search the internet for When Gordon Met Ella. Credits. This page was last revised on March 23, 2019. This page originally submitted on December 2, 2017, by Devry Becker Jones of Washington, District of Columbia. This page has been viewed 78 times since then and 9 times this year. Last updated on March 8, 2019, by Devry Becker Jones of Washington, District of Columbia. 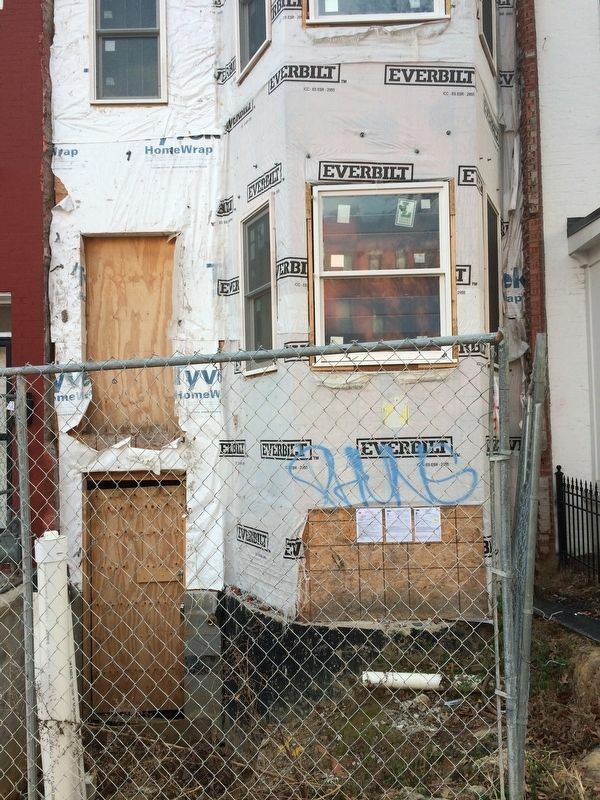 Photos: 1, 2, 3. submitted on December 2, 2017, by Devry Becker Jones of Washington, District of Columbia. • Bill Pfingsten was the editor who published this page.